October 2014: Florence | A party of one. 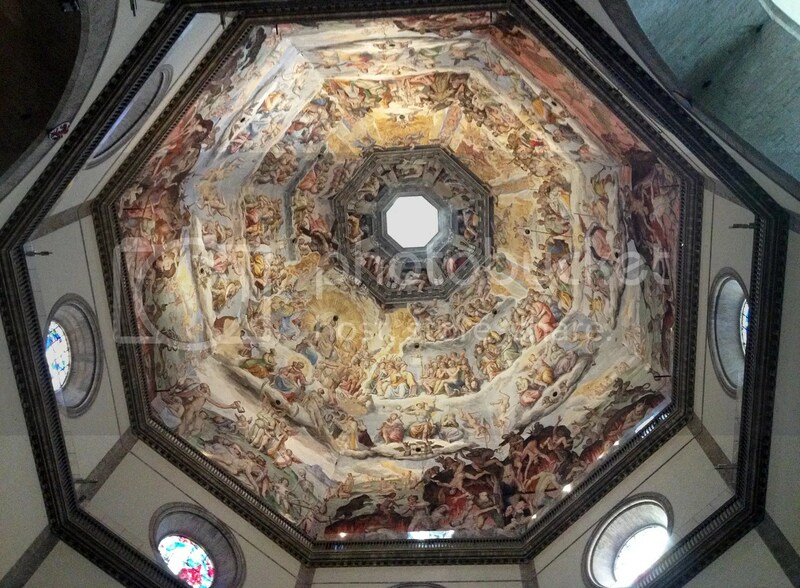 Our cab driver had to give us a scenic route around the famous Duomo and Giotto’s Campanile of the Florence Cathedral, or Cattedrale di Santa Maria del Fiore, to get around labor strikes, and I was in total awe. I loved the tiny cobblestone streets and seemingly ancient homes. I felt like there was a castle on every block. An unofficial honeymoon suite at the Borghese Palace Art Hotel. 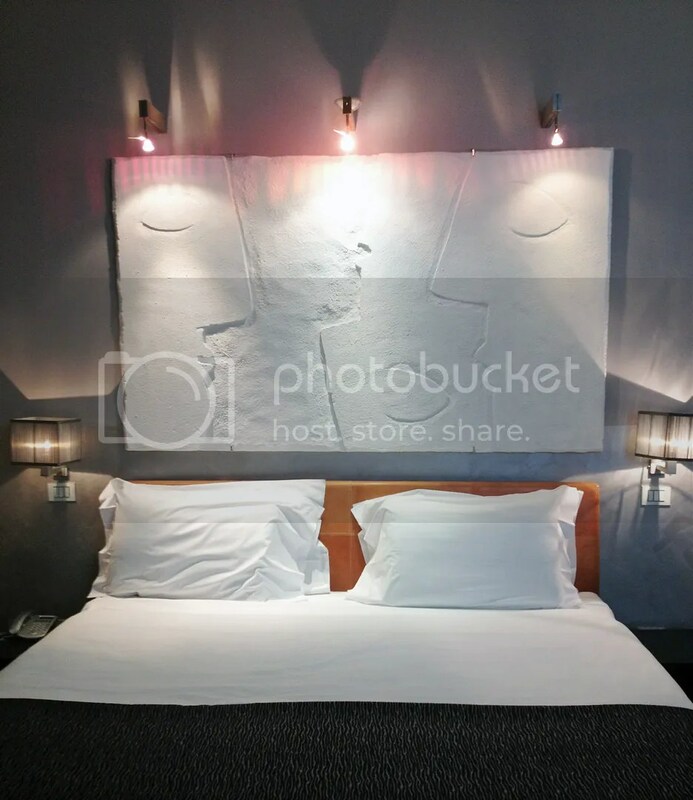 Our stylish, modern room at the Borghese Palace Art Hotel was equipped with a complimentary bottle of Prosecco chilling on ice for our honeymoon, and it was the perfect start to our stay in Florence. (A little Prosecco buzz on an empty stomach is no reason to delay another cold glass of Prosecco, even if your room has a mini fridge.) The Borghese was the only traditional hotel on our trip, and it was anything but, with modern art everywhere and a staff that acknowledged every time we came and went. It was reasonably priced, too. 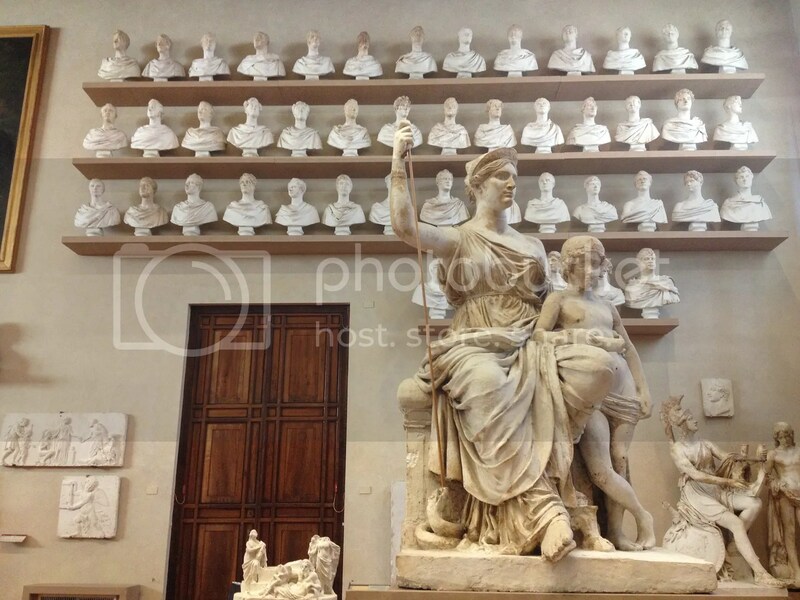 Works by students of the Accademia’s art school. Family and friends told me David was much bigger than they expected, and in spite of hearing that so many times, I was still surprised at the sight of it. 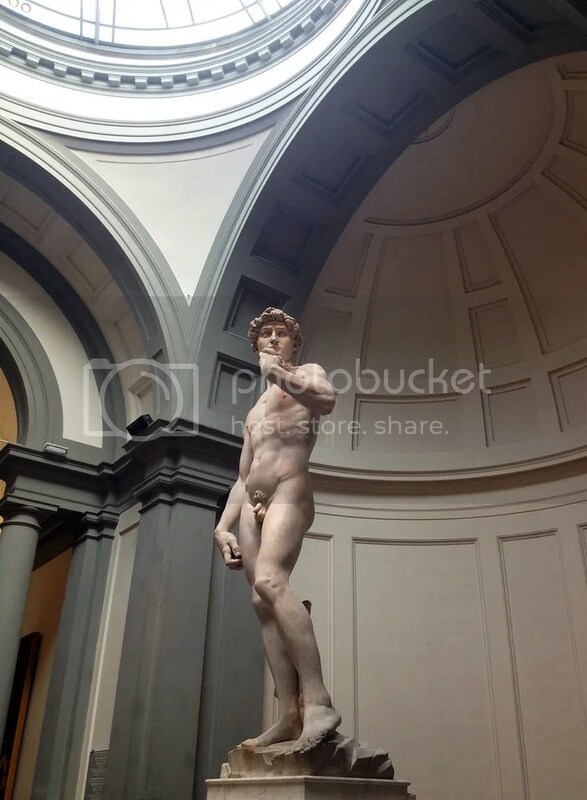 Listening to the guide, I thought it was particularly interesting that David was intentionally sculpted with a disproportionately large torso, arms, and head because he was originally intended to be placed at the top of the Florence Cathedral, and this would make him look proportionate from far below. 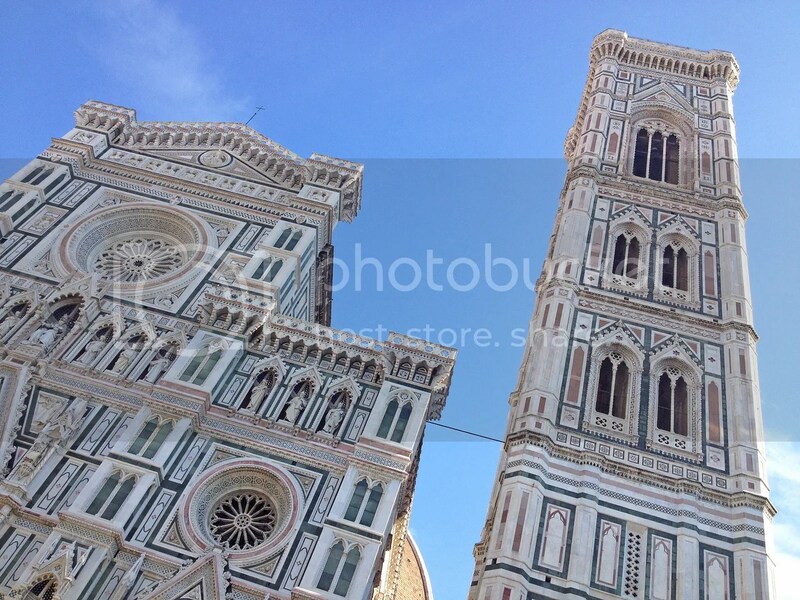 When lifting such a large sculpture to that height was realized to be an impossibility, after the entire miracle that was the construction of the Florence Cathedral in the 14th century, another site was chosen. I also appreciated that the block of marble Michelangelo used was deemed a reject by the quarry — awkwardly shaped — but he posed and positioned David within it to use it to its fullest potential. From there, we explored, stopping in to wherever interested us. We saw the Basilica of San Lorenzo, the parish and burial site for many members of the Medici family, which also displayed their large collection of relics, or small fragments of bones of saints contained within ornate jeweled boxes thought to be auspicious. 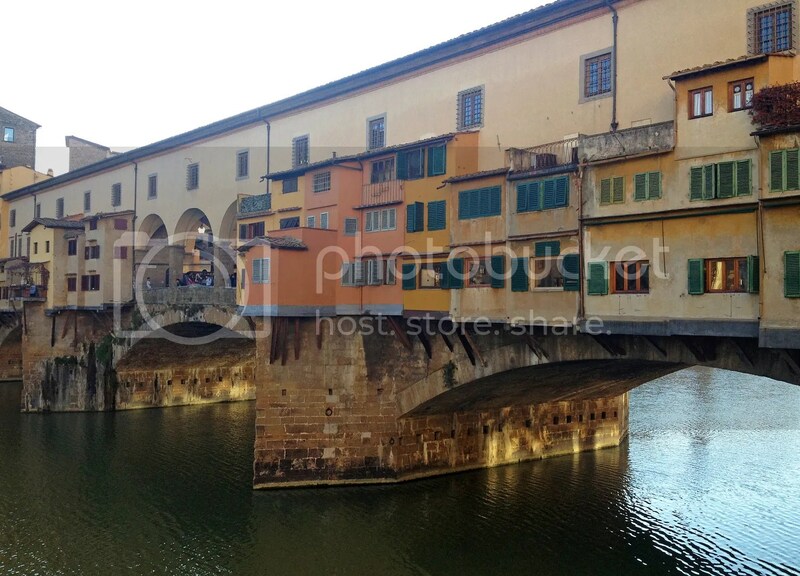 We saw the Ponte Vecchio, or “old bridge,” and it would be tempting to call it straight out of a storybook if not for the high likelihood that storybooks are based on it. And, long before we’d arrive to Alba, we found truffles. 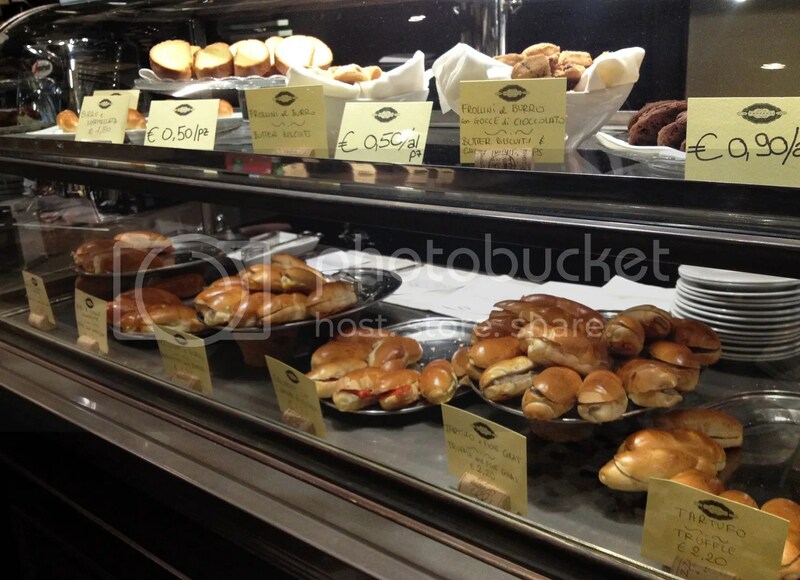 The Procacci Company is a 130 year old Florentine delicatessen specializing in all things truffled, and inside its doors, I could see display cases filled with beautiful plates of truffles, and little truffle sandwiches. Hungry though I was, I assumed it was all unaffordable. Still, I wanted a picture, so I asked the staff politely if I could take one, and they graciously welcomed me in. But when I looked at the sandwich prices, they were only $3 or $4 each. I couldn’t afford not to. It was naive of me to view black truffles as any kind of rarity in Italy, and understandably so. 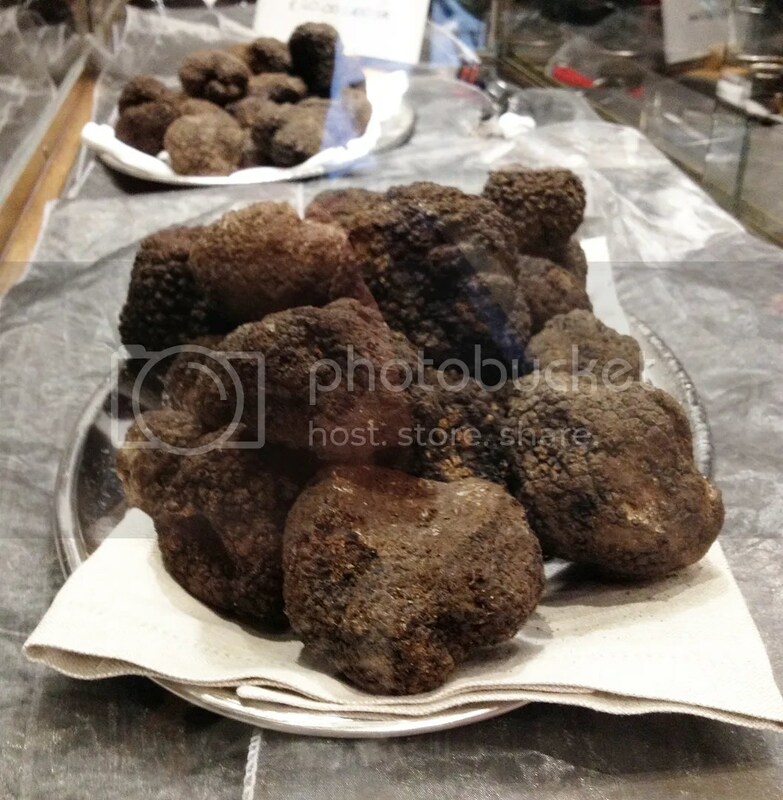 Black truffles and summer truffles can be found throughout much of central Europe, and their seasons are months-long. They keep and travel so well that my sister and I were able to buy a small black truffle in my rural Virginia hometown for about $15 one Christmas, though, admittedly, it was bland. In the US, black truffles are really the only truffle (discounting truffle oil, which is flavored with chemicals), and it had never occurred to me that I’d probably never had fresh white truffles before. White truffles come from the tiny Langhe region of Piemonte, especially in the hills around Alba, and they spoil after a week or two. 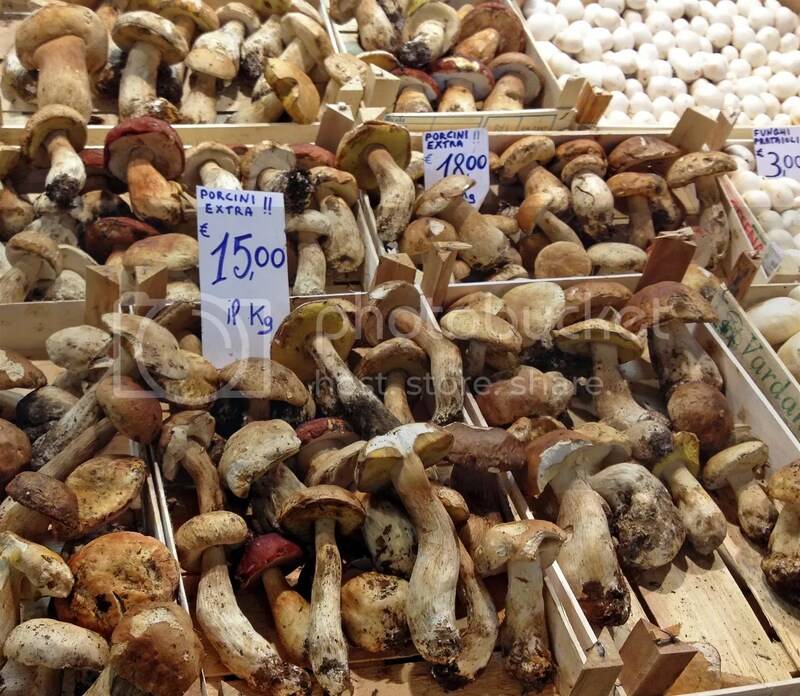 During their harvest from mid-October to mid-November, they sell for $6 thousand to $10 thousand per pound. We would soon be in Alba at the height of white truffle season, but, in the meantime, I was more than content to whet my appetite for them with Procacci’s black truffles. My husband joined me at a table against the huge storefront window for a glass of wine and a couple of sandwiches slicked with a black truffle paste and little besides, which were, of course, intoxicating, and even more so with sun streaming in and fashionable Florentines passing by. This little guy followed us everywhere in Florence. By the late afternoon, we felt as though we were really starting to see Florence. It is the perfect place for wandering and getting lost — and the further from the crowds, the better. We cleaned up at our hotel and ventured back out at sunset for an inexpensive dinner of aperitivi. 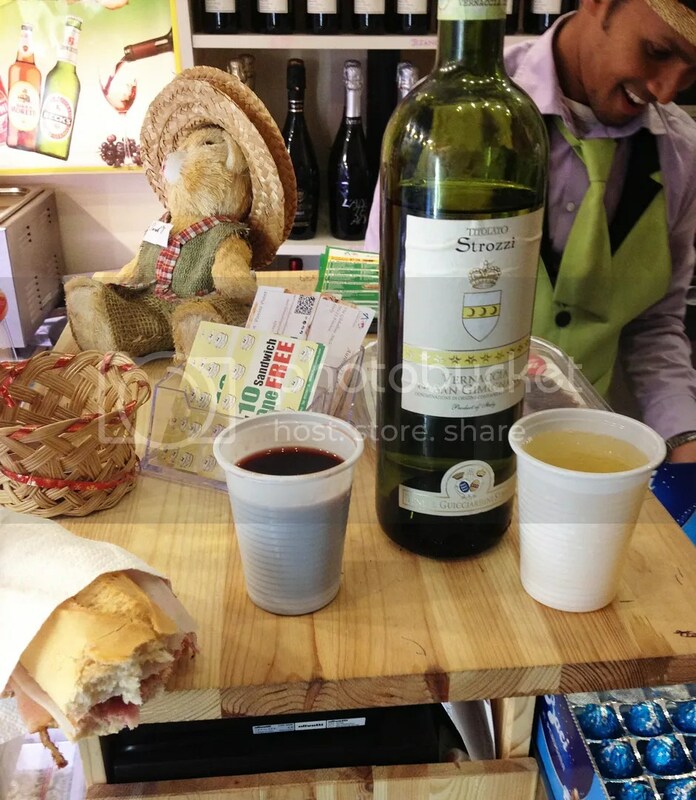 Florence is known for its aperitivo scene — cafes and wine bars with complimentary appetizer buffets for those ordering alcoholic beverages, and we were buying several glasses of wine while we were out on a given night, anyway. We started at Sei Divino, an intimate wine bar recommended by our Lonely Planet and frequently cited as a great find on expat blogs. We arrived early enough to have our pick of tables, but it quickly filled. We were new to aperitivo, so we approached cautiously — waiting for our server to invite us to the buffet, leaving some white space on our plates, taking small portions of the more expensive offerings, spacing out our return trips, not ordering only the least expensive wines on the menu. Meanwhile, we watched the regulars at the table next to us, two young guys, load up plate after plate after plate while drinking the cheap stuff, and we relaxed a lot after they got up for what seemed like their third time in 15 minutes. There were pastas, olive and eggplant spreads for fresh bread, cheeses, cured meats, and cooked vegetables, as well as what I can best describe as casseroles, delicious baked dishes containing it-mattered-not-what. We stayed for around two hours and enjoyed a few glasses of wine and a few plates each, mostly staggered, so we could try new dishes as they came out and share. After Sei Divino, we went to Oibò. We were dressed warmly enough to be seated in the crowded outdoor area, but the autumn air was brisk. Oibò was more of a bar scene, and its aperitivi were mostly cheesy breaded and fried foods — great for absorbing alcohol but not for showcasing the breadth of Tuscan comfort food. We were pretty full on arrival, anyway, so it was the perfect spot for a nightcap and melty cheese course. Early the next morning, I decided I finally needed to treat a bee sting from the day before our wedding on my thigh — I’d been way too busy to get to a drugstore during the festivities. A week later, the site was redder, puffier, firmer, itchier, and more disconcerting than ever. We found a storefront with a first aid cross sign near our hotel and searched the shelves futilely. I finally went up to the pharmacist and made a buzzing sound with a gesture toward my leg ending in a pained look, which he understood as a mosquito bite, and I gleefully accepted his offering of gel idrocortisone from behind the counter. It worked. We then set off for the Basilica of Santa Croce, where such luminaries as Michelangelo, Galileo, Machiavelli, Dante, and Rossini are buried. A number of other important Italians of the late Middle Ages and Renaissance are also buried there, with many of their monuments forming the floor you walk on, with brief eulogies and stone cut-outs of shields, crests, and religious symbols, and even castles and skull-and-crossbones. Probably not in Michelangelo’s final will and testament. Those columns aren’t even real. Whether Michelangelo wished to be buried in Rome or Florence is still debated by scholars of the Renaissance today, but I cannot imagine that he would have been thrilled with the Florentines’ tribute. This is going to sound really disrespectful, because it is: Michelangelo’s funerary monument was maybe the gaudiest thing I’ve ever seen, and I’ve been to Graceland. Sculptures by Giorgio Vasari of a sculptor, painter, and either architect or poet, depending on your source, guard his polished marble tomb. But a colorful fresco in Michelangelo’s style, with muscular cherubs and Jesus at Calvary and fake columns over and around the tomb, made me cringe. It was a far, far, so far cry from the Sistene Chapel. 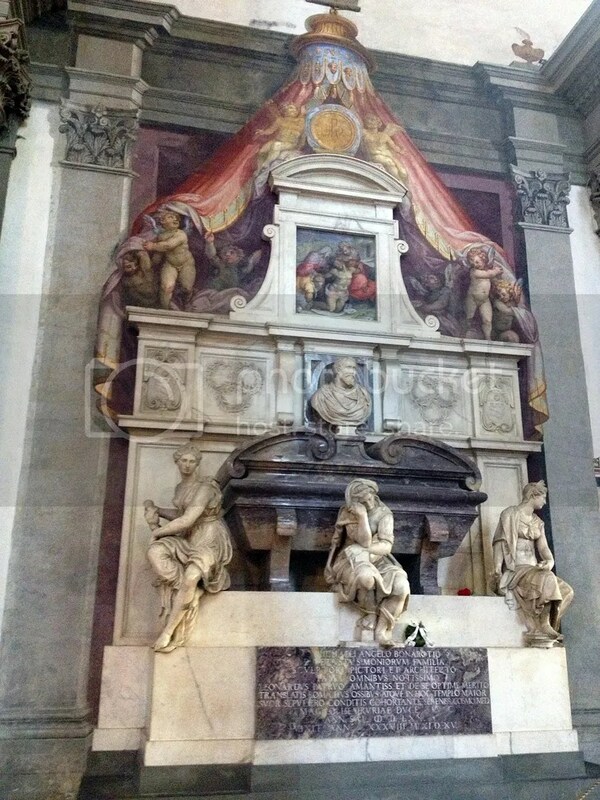 Leave it to the hell expert, Dante, to have the most tasteful funerary monument of the lot. The cathedral and bell tower, looking much shorter than they really are. 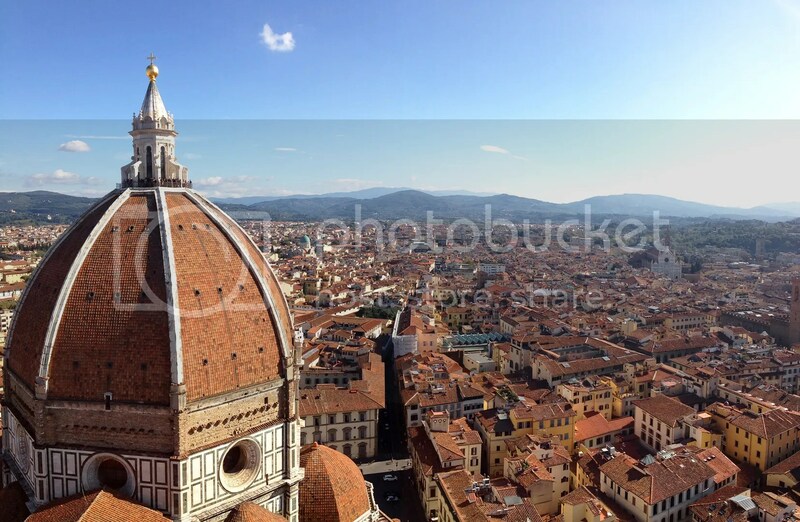 My husband hoped to climb the steps of both Giotto’s Campanile, or bell tower, and Duomo, or dome, of the Florence Cathedral, while it was still early. But for an ascent to heaven, basically, this was a personal hell — as afraid of falling off of cliffs or out of tall buildings as I am, one was more than enough for me. When we arrived and saw the long lines, he was content with one, too. I’ve never been so happy to see so many tourists. We opted for the Campanile. The climb was really hard. I’m young, I’m the quintessential “Mediterranean diet” advocate, and I exercise regularly, but I kept telling my husband every few flights that I thought I was going to have a heart attack and I meant it. It was mostly that I was out of breath, but also, every glimpse out over Florence from the almost 700 year-old windows was terrifying. I tried to count the 414 stairs as I went up to keep myself motivated, but somewhere around the middle I panicked and lost track, so I was completely surprised when we got to the top sooner than I expected, or wanted. Once at the top, I clung to the wall surrounding the stairwell, making sure my back or at least a leg or arm leaned against the structure within tower’s observation deck. I eventually got the courage to go near enough to the wire fencing over the stone guard rail to take pictures, but then I started to fear I’d fling my iPhone out and kersplat someone 414 steps below me. My husband was everywhere taking pictures and eventually insisted that I get a few of myself with the Duomo and the rest of Florence behind me — which meant actually standing against the guard rail. I sulked and sweated and finally turned my back to the city, then lunged forward on my left foot for good measure. “Did you get the shot?” I asked through my nervous grin. Not my first pig’s head display. From the Campanile, we went to the Mercato Centrale, Florence’s famous farmers’ market, where we waited in another long line at Da Nerbone to order not the famous tripe or boiled beef sandwiches, but the lesser famous “porchetta,” chicken liver crostinis, and risotto. I remember the livers as soupy, underseasoned, and gamey, and the risotto as bland, and I don’t even remember having anything else, which makes the quote marks around the porchetta in my travel notes all the more understandable. But the crowds were memorable. A stinky guy in line in front of me kept backing into me and walking through us so we had to touch, and I hate being touched by strangers! And we figured out fast that the only way we’d get two seats at the few cramped, spilled-on picnic-style tables would be to move in on a family that seemed to be close to finishing before they even stood up. Everyone was doing it, and we actually had a tray of hot food unlike the rest, so we didn’t feel too bad. A group did it to us, too. Lines to get into the Ufizzi Gallery were long, too, so we saved it for the following morning and did more exploring instead. 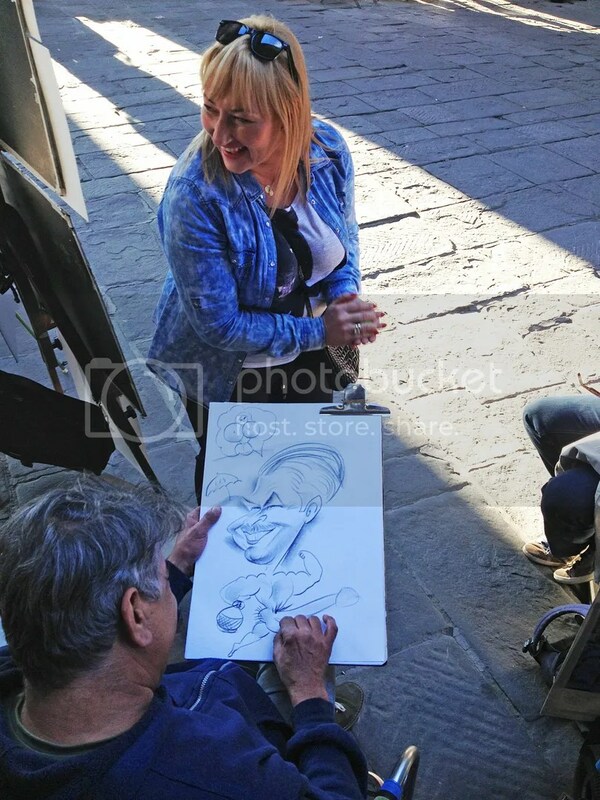 We found a funny caricature artist doing an X-rated portrait of a guy for his wife. I had no idea what they were saying, but everyone was laughing — the universal language. 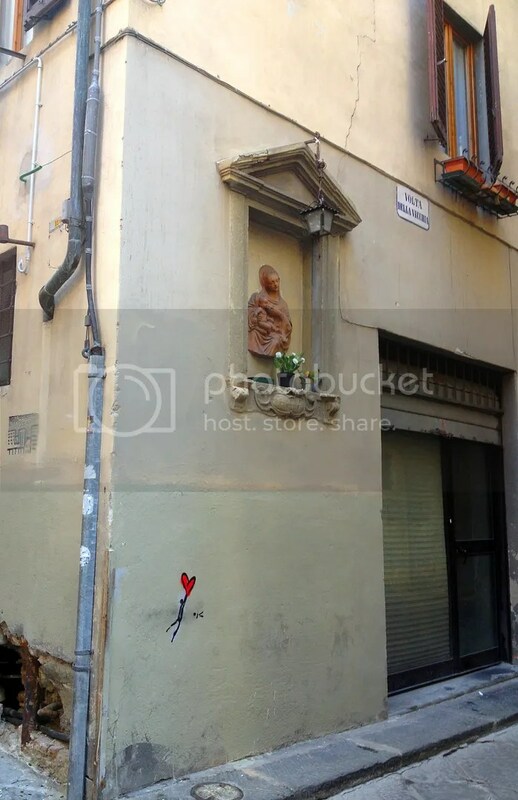 We took pleasure in finding little balloon heart doodles on various walls and buildings by a street artist. And we looked at Florence’s famous leather goods. Look closely at the picture. The subject is just out-of-frame to the right. 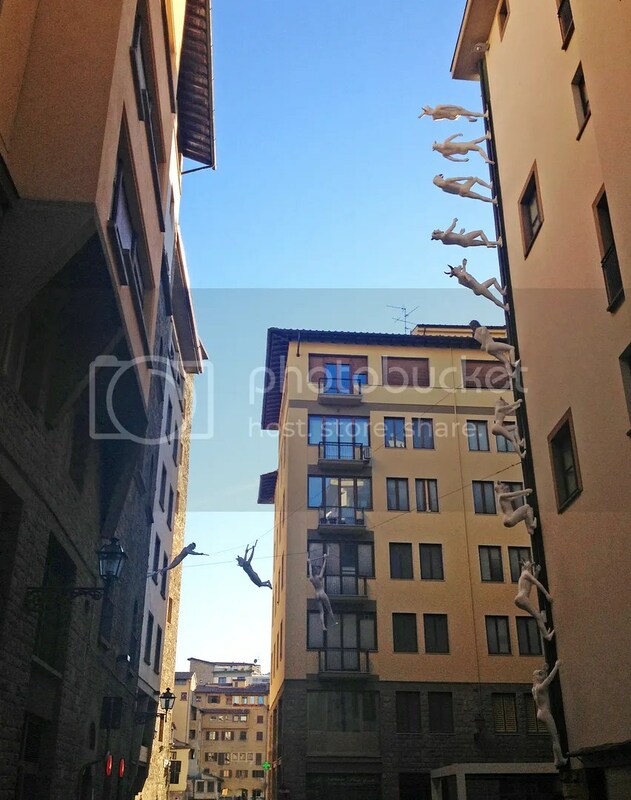 Everyone says Florence is romantic, but trying to do too much can get in the way of that. While had perfectly clear autumn weather our entire trip — nothing short of a miracle — it meant that we rarely stopped being tourists to be newlyweds. But that night, we had the most romantic dinner. We asked the young man and women staffing our hotel concierge desk where we should go for Bistecca Fiorentina, and they produced a few restaurants that, we guessed, the hotel has relationships with or where tourists seem to be the most comfortable. They were enthusiastic, but we wanted passionate. My husband then asked where their families go to celebrate birthdays and anniversaries. One young woman’s eyes lit up. A minute later, she had called in our reservation, and we were off to Trattoria I’Parione. We were greeted warmly at the door and led downstairs to a cozy table in their wine cellar. Our menus were not in English, and our server spoke none, either. It was exactly what we wanted. We started with a creamy, pillowy gnocchi appetizer that was my favorite pasta dish yet on the trip. And oh, the steak. The meat was expertly seasoned and crusted and cooked to a tender medium rare, then cut off the bone, sliced into smaller pieces, and presented with the miniature steaks standing up on their sides against the vertical bone, surrounded by roasted potatoes. In my quick travel notes, I wrote, “even the potatoes perfect.” The owner embraced us warmly on the way out, and I gleefully toted leftover steak and potatoes to our hotel for my breakfast. We devoted our last half-day in Florence to the grandiose Uffizi Gallery, which was commissioned by Cosimo (the younger) Medici, designed by Giorgio Vasari, and constructed from 1560 to 1581. 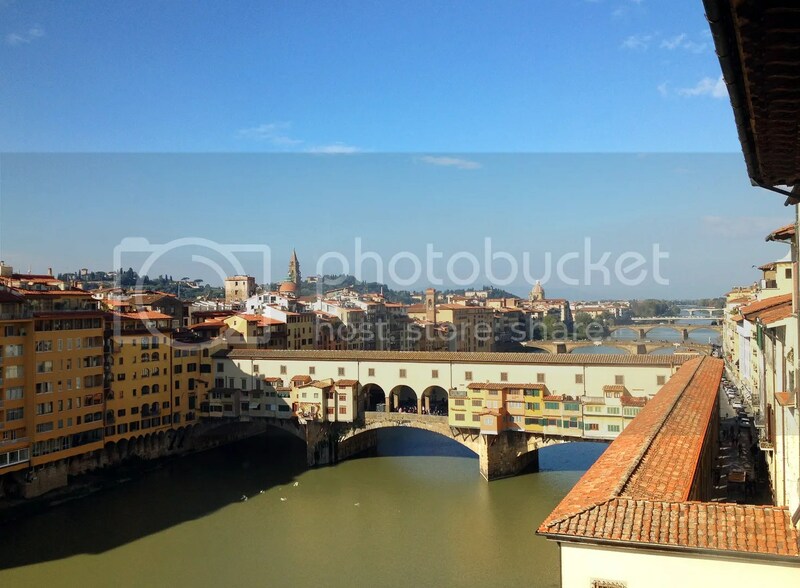 Uffizi means “offices,” and the palace was literally an office building in its early life. But it also displayed many of the art works collected and commissioned by the Medici family, and before long, the Medici family had lost power, leaving the building, and its art, to Florence. Its enormous collection has been open to the public for 250 years, making it one of the first modern museums. 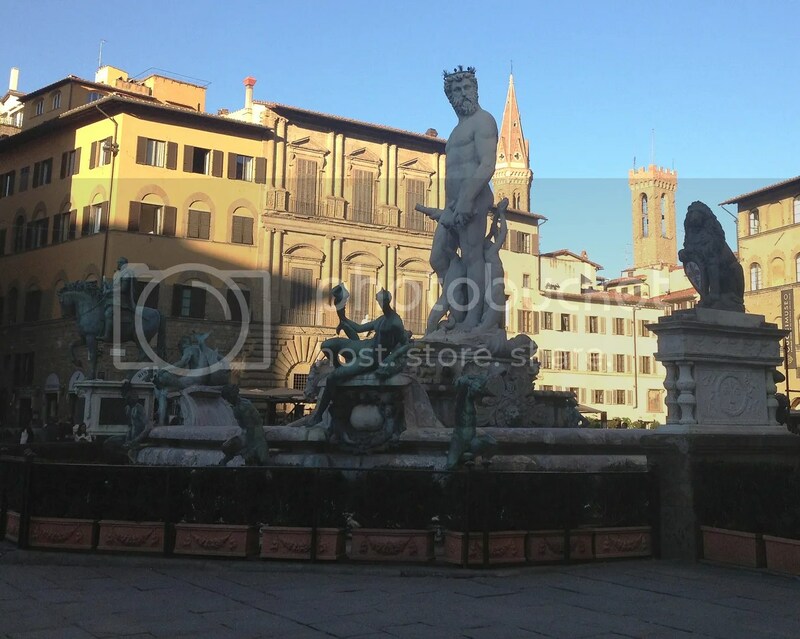 After having had a good experience with a Rick Steves audio guide to Michelangelo’s David, we decided to download his Uffizi guide. This was mostly my husband’s idea. He has an art history minor, and he is incredibly knowledgeable about Medieval and Renaissance art. And, in spite of being not at all religious, he seems to have a special affinity for icons, altar pieces, and depictions of the Last Supper. I, the one who actually identifies with a religion, goes to church, and says prayers before bed, find religious art to be pretty boring. I’ve definitely wondered before where the cone-shaped princess hat came from. Apparently — actual princesses. 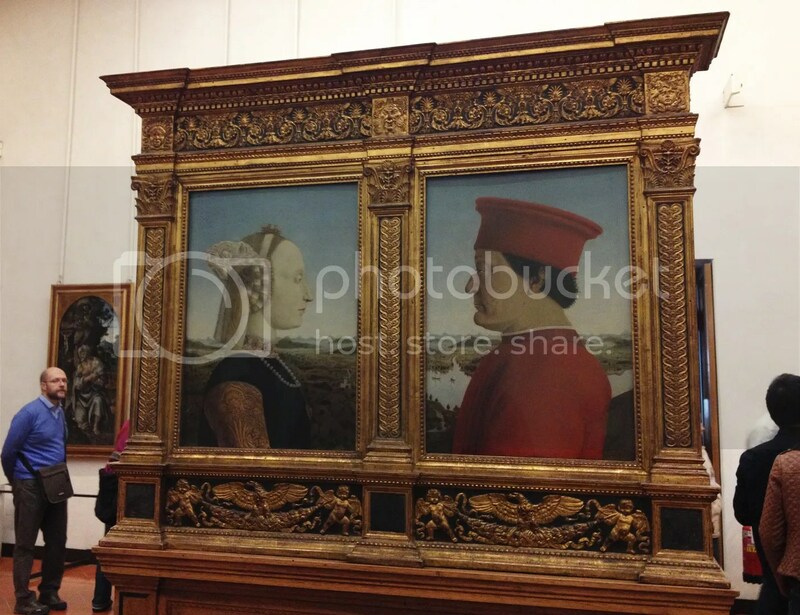 My husband was in heaven in the Uffizi. And he had been before — none of this was new to him. So when we donned our earbuds to listen to the audio guide on our iPhones and none of the art matched up to the gallery room numbers, I figured he would be fine with foregoing the guide and touring on our own. But no. Not my husband. He searched down the pieces being discussed while I dutifully followed, eyes rolling like bocce balls. 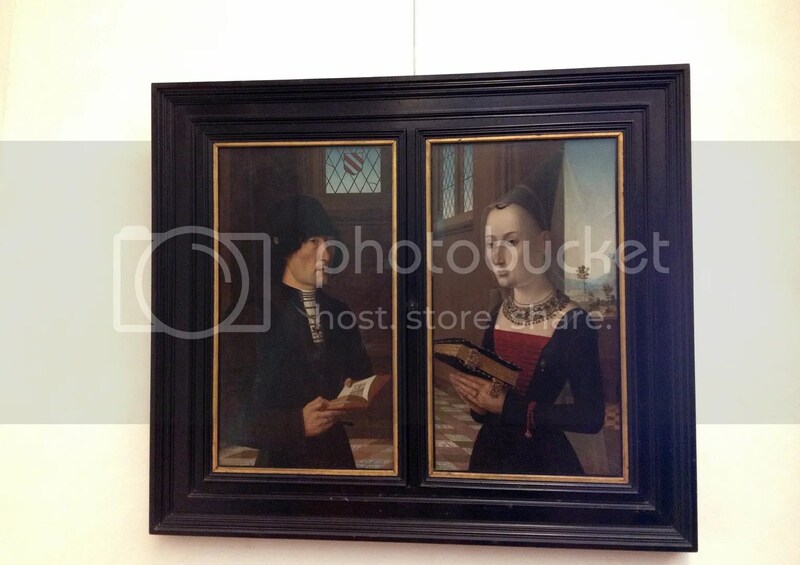 We spent at least two hours in the museum doing this, without finding a large number of works promised in the audio guide, but we had seen so much — I was content to leave and enjoy our last two hours wandering and sitting down to a leisurely lunch, and my husband seemed to look forward to it. Until we found the rest of the art. Exiting the building requires a long walk from the main galleries down a lot of stairs, around a lot of corners, and through a lot of corridors, and just when I thought we were close, there were a half dozen more galleries. With a lot of really important art. And in went the ear buds once more. 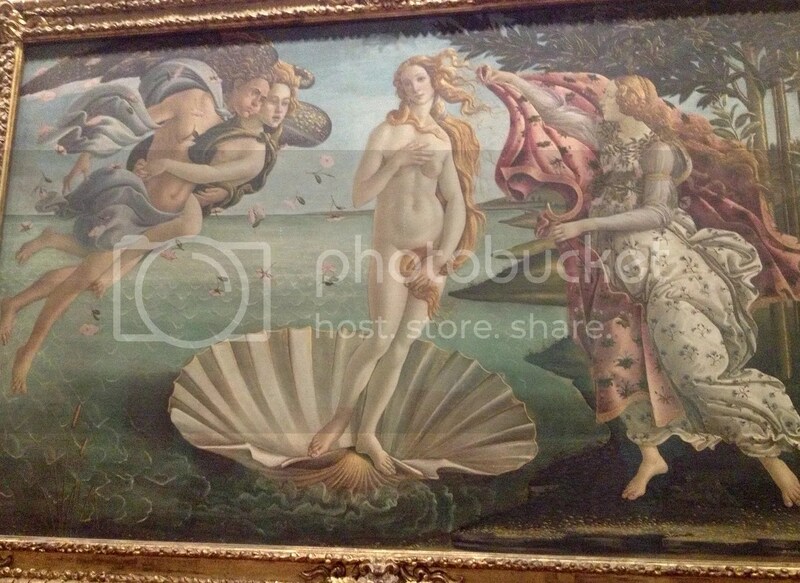 Botticelli’s Birth of Venus, aka what everyone goes to the Uffizi to see. 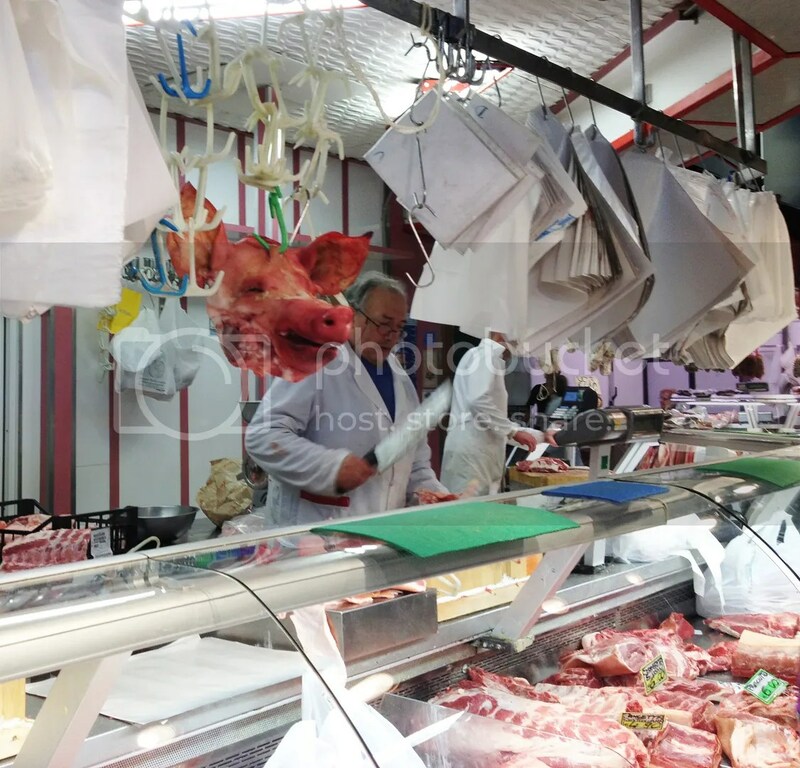 No leisurely lunch — peppery porchetta and silly-good Verdicchio consumed far more quickly than they deserved — but I was glad for the opportunity to say goodbye to the owner of the tiny deli near our hotel who sold them to us. Each afternoon, he set up a small wooden table on the sidewalk in front of the shop and crowded it with self-serve wine bottles and plastic to-go cups, and charged very little for a very big pour. I visited a few times, for wine or bottled water or snacks, and he was always grinning and trying to help me, and he seemed eager to practice his English. I learned on my last visit that he was preparing for his first trip to America, with his wife, and I felt guilty about how poorly I’d prepared for basic etiquette in Italian. We left off in a cloud of thank you and grazie, and without further ado, I was off to the Cinque Terre. One of my favorite people in the whole country.